While playing around with the new REAPER v4.25+ JSFX functions I have created a simple free (LGPL) mono/poly synth in JSFX. It features up to 16 notes polyphony, ADSR, several bandlimited waveforms, a zero-delay feedback low-pass filter, a LFO modulating pulse width or frequency, and supports MIDI Note On/Off, Sustain, and Pitch Wheel. ab_mono: A/B two mono channels. drum_synth: Simple drum synth (GM compatible, although incomplete). 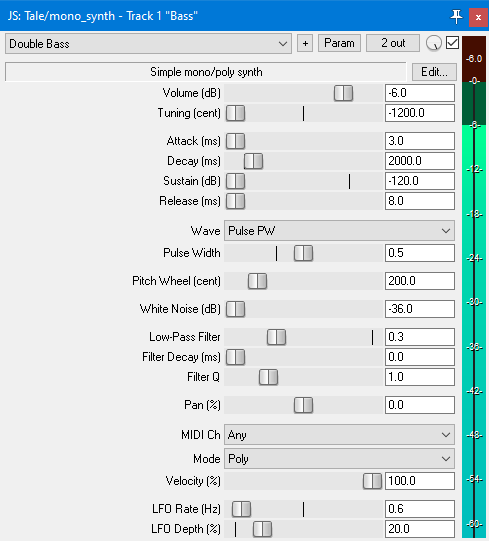 poly_mono_midi_router: Dynamic poly/mono MIDI router (see tutorial by David Else). random_midi_notes: Random MIDI note generator. array.jsfx-inc: Simple two-dimensional array interface. fft_real_synth.jsfx-inc: Real FFT bandlimited synthesis. lfo.jsfx-inc: Naive (non-bandlimited) low-frequency oscillator. midi_queue.jsfx-inc: Sample accurate MIDI queue. poly_blep.jsfx-inc: PolyBLEP quasi-bandlimited tone generator. sine.jsfx-inc: Efficient sine/cosine wave oscillator. uint.jsfx-inc: Low-level 32/64-bit unsigned integer operations. zdf_filter.jsfx-inc: Zero-delay feedback state variable filter. // Process ADSR envelope and apply it to oscillator. Sets the ADSR envelope time (specified in seconds) or the gain [0.0..1.0] factor, and returns the coefficient or the gain factor. Starts processing the ADSR envelope, scaling it to [0.0..scale], and returns the state. Continues processing the ADSR envelope, and returns the state. Processes the ADSR envelope, and returns its state. Note: You should call this function from the @sample section. Resets the ADSR envelope, and returns the state. The current state (1=attack, 2=decay, 4=sustain, 8=release, 0=off). The scaled ADSR envelope output. // Remove note if somehow it is already playing. // Add note, and set pointer to it. // Update pointer to new last note. Sets the offset and size of the local memory buffer to store the array in, and returns the next available memory index (i.e. index+rows*cols). If cols is omitted, then it defaults to 1. Allocates/deallocates a block of local memory to store the array in, and returns its index. Returns a pointer to the local memory index of the specified row. Adds a row to the end of the array and returns its local memory index. Note that the row is added but not initialized (i.e. it does not contain any data yet, nor is it zeroed.). Inserts a row into the array. Note that the row is inserted but not initialized. Removes a row from the array. Removes all rows from the array. Returns a pointer to the local memory index of the first row, or -1 if there are no rows. Returns a pointer to the local memory index of the next row, or -1 if there is no next row. Returns a pointer to the local memory index of the last row, or -1 if there are no rows. Finds a value in the array at the specified column (0 by default), starting at the specified row pointer (first row by default), and returns the local memory index of the entire row, or -1 if the value was not found. The local memory address of the buffer in which the array is stored. The current size of the array in rows. The number of columns in each row. Sets the complex number to a + 0*i. Sets the complex number to a + b*i. Sets the complex number to the value of another complex number. Sets the complex number using polar coordinates, converting from polar to trigonometric form. Returns the norm of the complex number i.e. Re(z)^2 + Im(z)^2. Returns the absolute value (or modulus or magnitude) of the complex number. Returns the argument (or phase) of the complex number. Returns 1 if the complex numbers are equal, or 0 otherwise. Returns 1 if the complex numbers are not equal, or 0 otherwise. Sets the complex number to the result of the operation on two complex numbers. Sets the complex number to the result of the operation on a complex number and a real number. Sets the complex number to the result of the operation on a complex number. Sets the complex number to the result of the function of a complex number. Sets the complex number to a complex number raised to the power of another complex or real number. Sets the complex number to the trigonometric function of a complex number. The real/imaginary part of the complex number. Uses the real instead of the complex FFT, which is almost 2x as fast, but requires REAPER v5.25+. See Tale/fft_synth.jsfx-inc for more information. Sets the offset and size of the local memory buffers to render the waveform in, and returns the next available memory index. If necessary the offset will automatically be realigned (i.e. rounded up) to prevent the FFT from crossing a 65,536 item boundary. The size of the FFT is specified by the second parameter, and must be 16, 32, 64, 128, 256, 512, 1024, 2048, 4096, 8192, 16384, or 32768. Note that the FFT requires real/imaginary input pairs, and two buffers are used internally, so a size of 1024 actually uses a total of 4096 items. Note: There is also a real FFT optimized version of this library, which is almost 2x as fast, but requires REAPER v5.25+, see Tale/fft_real_synthesis.jsfx-inc.
Realigns index so index+size will not cross a 65,536 item boundary. Allocates/deallocates two blocks of local memory to render the waveform in, and returns its index. Sets the oscillator frequency (specified in Hz), and returns the frequency in seconds/sample. Sets the oscillator frequency to the specified MIDI note and tuning (in Hz), and returns the frequency in seconds/sample. Sets the oscillator frequency (specified in seconds/sample), and returns this value. Recalculates the number of harmonics, and returns this (non-zero) number if it has changed, indicating that the waveform should be rerendered. Returns zero if the number has not changed. If the waveform contains only odd harmonics, then you can use four_update_odd() instead of four_update() to ignore changes in even harmonics. Similarly four_update_one() only checks the first harmonic. Resets the number of hamonics, forcing the next call to one of the update functions to return non-zero. The first form sets the DC component in the Fourier coefficients, and returns this value. The second form sets both the DC component and the phase offset [0.0..1.0), and returns the local memory index of the first harmonic cosine/sine pair. Takes the FFT of the (non-bandimited) single cycle waveform in the wavetable buffer (a real signal of length size*1). Renders a single cycle waveform in the wavetable buffer by taking the inverse FFT of the Fourier coefficients. If sigma is specified and is non-zero, then sigma approximation is used to eliminate (most of) the ringing artifacts caused by the Gibbs phenomenon. Extracts the DC/RMS value from the Fourier coefficients. Calculates and returns a sample by adding cosines/sines. Note: Because this function needs to add m-1 cosines/sines, it can be really, really slow. Applies sigma approximation to the Fourier coefficients (cosine/sine pairs) at the specified local memory index. The local memory index of the wavetable/FFT workspace. The local memory index of the Fourier coefficients (size/2 cosine/sine pairs). The size of the wavetable in samples, which is also the number of Fourier coefficient cosines/sines (i.e. there are size/2 Fourier coefficient cosine/sine pairs). The oscillator frequency, in seconds/sample. The number of harmonics (up to and including half the Nyquist frequency). Sets the pulse width [0.0..1.0] of the waveform, and returns this value. Sets the slave/cutoff frequency (specified in Hz) of the hard sync or filtered waveform, and returns the slave/master frequency ratio. Note: You should always first set the master oscillator frequency, and then set the slave/cutoff frequency. If you change the master frequency, then you will probably also want to update the slave frequency. Sets the integer number of steps (>=1) for the stepped waveform, and returns this value. Calculates the Fourier coefficients that define the waveform, and stores them in the coefficient buffer. Approximates the Bessel function of the first kind order 1 on the integer n (>=0) multiplied with $pi, i.e. y = j1($pi*n). The local memory index of the Fourier coefficients (cosine/sine pairs). The number of cosines/sines, i.e. there are size/2 Fourier coefficient cosine/sine pairs. The pulse width [0.0..1.0] of the waveform. The integer number of steps (>=1) of the stepped waveform. The cutoff/oscillator frequency ratio of the filtered waveform. Returns a sample of a waveform, and increments its phase. Note: In v20151024 the phase of lfo_full() and lfo_trip() has been corrected. To convert code relying on the old behavior, synchronize the phase to t-0.25 for lfo_full(), and to t-(0.75+0.5*pw) for lfo_trip(). Synchronizes the oscillator with the specified phase, and returns the normalized phase. Note: You can safely specify out or range (and even negative) values here. Increments the oscillator phase, and returns it. Note: All waveform functions automatically increment the phase. Returns the (constant or pulse width/slave frequency dependent) DC value for the waveform. Fast approximations of sin(x) and cos(x) for x in the ranges of [-$pi..$pi] and [0..2*$pi]. Fast exp(x) approximation ((1+x/n)^n, where n=2^8). The current phase [0.0..1.0) of the oscillator. Allocates a block of local memory, and returns its index. If size is 0, then returns the next available index. Allocates a block of local memory that is aligned in such a way that it will not cross a 65,536 item boundary, and returns its index. Allocates a block of local memory of num*size items, and initializes it to zero. Changes the size of the memory block, moving it to a new location if necessary. If ptr is 0, then it calls malloc(size) or aligned_malloc(size). Deallocates the memory block, and returns 0. // Set MIDI queue local memory index and size. // Receive MIDI messages and add them to queue. // Remove MIDI message from the head of queue. Receives any MIDI message, and stores it in the msg1, msg2, and msg3 instance variables. Note: The simple interface doesn't actually queue any MIDI messages, so it can and should be used on its own (i.e. without the other functions). Sets the offset and size (omit for non-bounded size) of the local memory buffer to store the queue in, and returns the next available memory index (i.e. index+size*3). Allocates/deallocates a block of local memory to store the queue in, and returns its index. Receives any MIDI messages, optionally filtering by channel (0..15, <0=any) and status byte (1=Note Off, 2=Note On, 4=Poly Aftertouch, 8=Control Change, 16=Program Change, 32=Channel Atertouch, 64=Pitch Bend). Checks if a MIDI message is available, removes it from the queue, and stores it in the msg1, msg2, and msg3 instance variables. Adds a MIDI message to the queue. Rewinds (clears) the queue, so new MIDI messages can be added. Note: This function is automatically called by midiq_collect(). Rewinds the queue, preserving any left-over messages. Same as midiq_collect(), but without automatically rewinding the queue first. The offset within the current sample block, in samples. The MIDI message that was last removed from the queue. A flag indicating that a MIDI message is pending (i.e. idx<=ofs), and the sample index [0..samplesblock-1] of the next midiq_recv() call. The local memory index and maximum size (in MIDI messages) of the queue. Pointers to the head and tail of the queue. Initialises the random number generator with the specified seed value (an integer in the range 1 through 2^31-2), and returns this value. Sets the black noise density (0..1), and returns this value. Sets the feedback coefficient of the leaky integrator used for generating Brownian noise to the specified RC time constant (in seconds), and returns the filter coefficient. The leaky integrator behaves like a high-pass filter with a cutoff frequency (in Hz) of 1/(2*$pi*rc). Note: lcg_brown() will automatically set the default RC time constant if none has been set. Returns a sample of noise. Returns a psuedorandom number between 0 and the parameter. Blue/violet noise generator pink/white noise output. Skips upsampling, so you can generate a signal at 2x oversampling rather than upsample a signal. Downsamples the signal 2x, and returns the downsampled sample. Resets the oversampler filter state. The current (y1) and the next (y0) oversampled sample. Note: Although the maximum frequency supported is srate/4, you can safely specify higher frequencies, even beyond srate/2. Note: In v20151024 the phase of poly_full() and poly_trip() has been corrected. To convert code relying on the old behavior, synchronize the phase to t-0.25 for poly_full(), and to t-(0.75+0.5*pw) for poly_trip(). Call this before changing the waveform to poly_stairs() or poly_ham(). Returns a polynomial around a discontinuity (i.e. when it passes 1.0 and wraps to 0.0), or 0.0 otherwise. The frequency dependent gain [0.0..1.0]. Sets up the filter for the specified cutoff frequency (in Hz), and Q and gain factors, and returns the a0 coefficient. Modifies the filter by applying the specified output gain or dry/wet mix. Note: You should always first setup the filter, and then modify it. If you change the filter frequency/Q afterwards, then this will reset the gain and dry/wet values, and so you will have to modify them again. Sends a sample through the filter, and returns its output. Resets the filter state to the specified input value, or to zero if the value is omitted. Converts bandwidth (in octaves) to Q factor, or vice versa. Scales the filter coefficients (i.e. divides by a0), and returns a0. Note: The first coefficient (a0) is not included here, because all coefficients are scaled (i.e. divided) by a0, after which a0 itself would always be 1. The setting functions return the original a0 value, should you need it (e.g. to get the original, non-scaled coefficients). Direct Form 2 filter state. Sets the filter cutoff frequency (specified in Hz), and returns the filter coefficient. Sets the filter cutoff frequency by means of the RC time constant (specified in seconds), and returns the filter coefficient. Sets the filter cutoff frequency so that it takes the specified time (in seconds) to almost fully (99.3%) change from one constant value to another (e.g. from 0.0 to 1.0), and returns the filter coefficient. Sets the feedback coefficient of the leaky integrator to the specified RC time constant (in seconds), and returns the filter coefficient. Sends a sample through the leaky integrator, and returns its output. High precision versions of setting/filter functions, which are less efficient but more precise. Note: There are no specialized high precision versions of the low-pass, all-pass, or leaky integrator filter funtions. The low-pass filter output value. The high precision high-pass filter output value. The high precision high-pass filter input value. Note: Although the maximum frequency supported is srate/2, you can safely specify higher frequencies. Note: The waveform functions automatically increment the phase. The current sine/cosine output values. Maximum security prison in Ossining, New York, USA. Both x and y should be unsigned 32-bit integers; n should be an integer in the [0..31] range. Returns an unsigned 32-bit integer. Both x* and y* are unsigned 64-bit integer namespaces; n should be an integer in the [0..63] range. Returns the low-order unsigned 32-bit word of the unsigned 64-bit result. The high/low-order unsigned 32-bit word of the unsigned 64-bit integer. Sets the offset and size of the local memory buffer that will hold the waveform, and returns the next available memory index (i.e. index+size). Allocates/deallocates a block of local memory that will hold the waveform, and returns its index. Returns a sample from the wavetable, and increments the oscillator phase. Note: The interpolation functions automatically increment the phase. Calculates the DC/RMS value of the waveform. The local memory index of the wavetable. The size of the wavetable, in samples. // Convolve with FIR filter. Returns the normalized window function for integers i = [0..n-1], n >= 16. Approximates the zero-th order modified Bessel function of the first kind. Returns the non-normalized Kaiser window function. To normalize divide by _wnd_i0($pi*alpha). Sets up the filter for the specified cutoff frequency (in Hz), and Q and gain factors, and returns the feedback precomputation factor (h). Note: In v20151024 the behavior of zdf_bp2() and zdf_ap() has been changed in such a way that these functions are not backward compatible. To convert code relying on the old behavior, replace zdf_bp2(freq, bw) with zdf_bp(freq, zdf_bwtoq(bw)), and zdf_ap(freq, bw) with zdf_ap(freq, zdf_bwtoq(bw)). Modifies the filter by applying the specified output gain. Note: You should always first setup the filter, and then modify it. If you change the filter frequency/Q afterwards, then this will reset the gain to 1.0, and so you will have to modify it again. Sends a sample through the filter, returns its output, and also stores the individual lowpass, bandpass, and highpass outputs. Specialized versions of zdf_svf(), each optimized for a specific filter type.